The Laugavegur Trail is an 84 km hiking trail located in the south central highlands of Iceland. The hiking trail navigates though Iceland’s most pristine wilderness areas and some of its’ most dynamic landscapes. Starting in Landmannalaugar in the Fjallabak Nature Reserve, the trail climbs up high into the mountains and gradually into the valley’s bellow. The trail finishes in Thórsmörk, however we will continue for an extra two days on the fimmvörðuháls pass where we will end our photo adventure at Icelands most famous waterfall, Skógafoss. We will be walking on average 14 kilometres a day (4-7 hours) with a small backpack. 4 out of the 6 hiking days are easy to moderate, 2 of the days are quite physically demanding so we ask that participants consider this. Transportation - from the BSI bus station in Reykjavik to the trailhead in Landmannalaugar and back to Reykjavik. Photography instruction - Not only have we been fortunate enough to explore this amazing part of the world time and time again, but we have had a lot of experience photographing it as well. We know where to be, and when to be there. Photography will be an important subject, with plenty of time allotted for photography instruction and practical shooting scenarios, guaranteeing you’ll come home with photos you’re totally stoked on. Every evening we will have discussions about photography techniques, practices, natural light, business and social media. Food - Your backpack should be holding only the essentials (listed below) giving you tons of room to carry your own food for 8 days, ie. oatmeal, Backpackers’ Pantry, protein bars, chocolate, coffee/tea. Preface: The weather in the highlands can be extremely volatile, extreme winds, intense rain, and even blizzards can occur at any time. We recommend you invest in quality gear that you can rely on. It’s likely we will experience all four seasons during our adventure! For specific recommendations on gear and equipment, please feel free to ask, we’re here to help!!! 1 Bathing suit for HOT SPRINGS! We promise this will all fit in your backpack! August 12/19 - meet at Bus Station in Reykjavik, 3.5 hour bus ride to Landmannalaugar, dinner, debrief, prepare for hike, mingle, RELAX IN NATURAL HOT SPRINGS. August 13/19 - Wake up early to begin our hike, 12km mostly uphill, lunch on glacier. 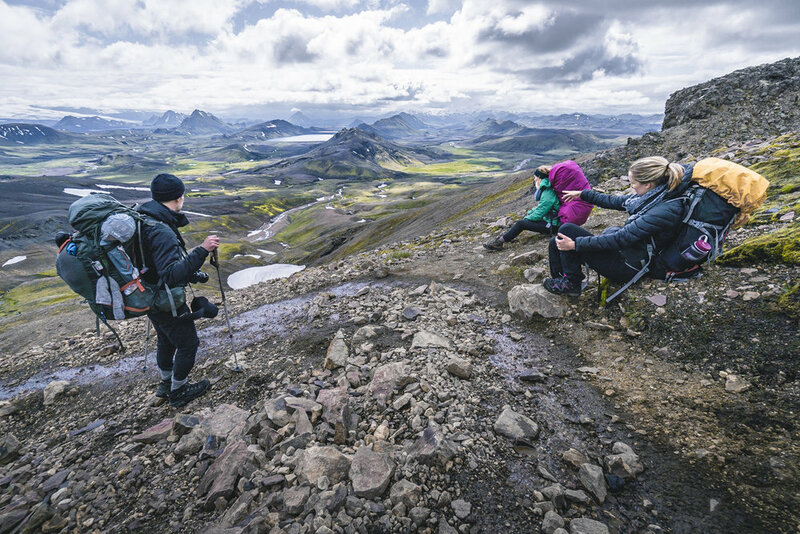 Hike another 12km through extremely diverse scenery, taking time to photograph the landscape as we descend down to Álftavatn Lake where our hut is located, dinner, socialize at the NEW REMOTE RESTAURANT. August 14/19 - Hike to Emstrur 16 km, FORDING 3 RIVERS! Walking through lush green landscapes completely different scenery from day prior, arrive at hut, dinner, photography discussions. August 15/19 - Hiking to Thórsmörk 15 km, walking along cliffside foot bridges and along rushing rivers, fording rivers and walking through forests, dinner, midnight sun photography, optional restaurant for refreshments. August 16/19 - 13km hike to fimmvörðuháls hut, absolutely epic views through the most scenic region in all of Iceland, eventually making our way up to our hut located directly between two massive glaciers, try to stay warm! August 17/19 - Traverse over snow and ice along massive volcanoes until reaching a roaring river which we follow along 22 massive waterfalls all the way to the world famous Skógafoss waterfall. August 18/19 - Morning light photography session at Skógafoss waterfall, travel back to the bus terminal in Reykjavik.